Linné on line – Drugs or herbal remedies? Linné on line Linnaeus and Pharmacy Plants are important Drugs or herbal remedies? There are several concepts within the area of medicinal plants where confusion is likely. One such instance concerns legislation whereas others are purely practical. They all have their origins in nature – either plants, animals or minerals. They can be pure chemical substances, or mixtures of several, as long as they are all natural. Examples within medicine and medicinal plants are camomile flowers, valerian roots or morphine and nicotine. These are products covered by pharmaceutical legislation, i.e., something that will cure, relieve or prevent illness, as well as certain diagnostic aids. They can be herb teas, plant substances or synthetic chemicals that are used for the treatment or prevention of illness. This is a sub-group of medicinal products, and it is important to note, that in Sweden, according to the law, they are classed as medical drugs. They are products that may be used for self-treatment, i.e., mild ailments that don’t require the intervention of a physician. The group includes less refined natural products, e.g., herb teas and plant extracts but not pure chemical substances from natural sources. They have no guaranteed medicinal effect but are considered to be harmless when used sparingly. The dividing point between them and food products or dietary supplements can sometimes be unclear. Most significantly, maybe, is that herbal remedies are recommended by the producer for use in connection with certain ailments. Dietary supplements are covered by legislation concerning foodstuffs and not by pharmaceutical legislation. Supplements to the daily diet can be plant extracts, minerals or vitamins. It is of importance that nothing on the packaging indicates that they can be used for treating or relieving any illness. Recently the concept of functional foods has been discussed widely, i.e., eating something as a preventive measure or for its medicinal effects on an illness. This is still a young branch of medicine but a lot of research is being done in this field. It’s not just a matter of immediate replacement in cases of deficiency diseases. If you don’t eat vitamin C you are liable to get scurvy or if you don’t eat enough protein you will get kwashiorkor. For example it has been demonstrated that certain inflammatory diseases are improved when the patient eats oily fish. A diet high in fibres can counteract cancer of the large intestine. The significance is that it is all the more important to eat a varied diet. Bruhn, J G 1990. Naturmedel – en läkemedelsgrupp som växer. s. 99-106 ur Naturliga läkemedel. (red. J G Bruhn), Apotekarsocietetens förlag, Stockholm. Rudérus, H 1992. Funktionella livsmedel – sega gubbar eller mat för segare gubbar? Kemisk Tidskrift 11:24-26. 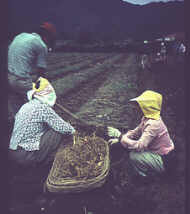 Harvesting ginseng roots in South Korea. Many of the plants sold in modern health food shops as natural health products, herbal remedies or health foods, are still or were once used in western school medicine. Here are some examples of such plants: arnica, birch leaf, bilberry, glossy buckthorn, yellow gentian, camomile, hops, milk thistle, senna, and valerian. The new big-selling plants ginkgo, ginseng and echinaceas, on the other hand, have entered the Swedish medical system in the past decades. Many natural products and health food producers, as well as health food shops in Sweden, are affiliated to The Swedish Health Food Council which teaches, informs and disseminates knowledge about health foods, natural products and alternative medicine.